The (breeding) missing link between old and new world? For reasons of timeliness, we want to start this article with a preview on the Prix d’Amerique 2018, which will come up with a great and probably well balanced field on January 28 (unfortunately without Nuncio, who will carry on as a stallion at Menhammar Stuteri this year). 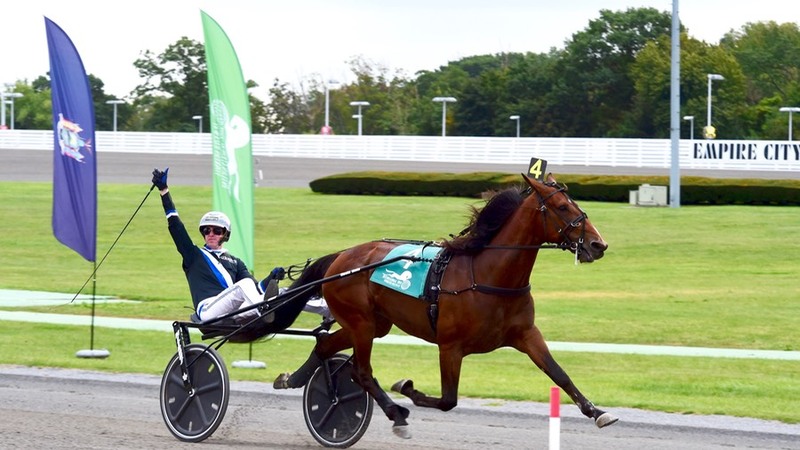 But even without Nuncio, the American Standardbred blood has a more than hot iron in the fire with Propulsion, the Muscle Hill son won one of the last preliminary tests, quite convincing on favorite Bold Eagle. The latter, of course, is France's strongest weapon and should still be the favorite in the PdA. Furthermore there are super horses like Sweden's Readly Express, which in turn is the absolute question mark of the heaviest trotting race in the world. 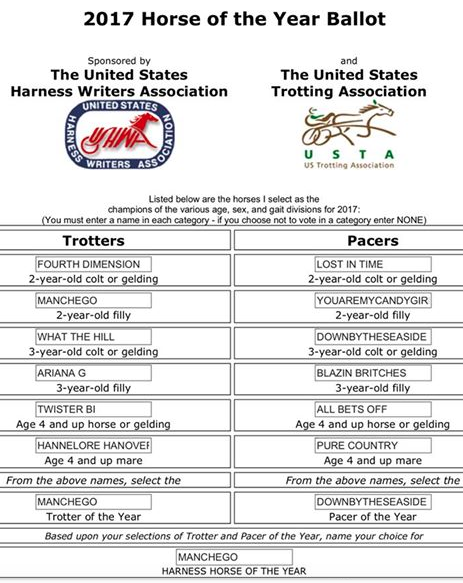 In addition to many other fantastic trotters from France, Norway sends with Lionel an absolute classy horse, but also Italy is well represented – with Twister Bi! With which the bow to this article is completed. It was a great performance that Twister Bi showed in the Yonkers International Trot on October 14. Many elder American visitors have been reminded on historic triumphs by thoroughbred legend Secretariat, when the Italian stallion just said goodbye to the then leading defending champion Resolve and ran away from the field like the others are just background actors. We maintain that Twister Bi, from the point of his pedigree, is the missing link between the old and new world. Which could be misunderstood because all the important blood of the stallion came from America. The key word has one name: Sharif di Iesolo. – Both colts have been the best racehorses in their crop without a doubt. Speedy Crown won the Hambletonian of the year 1971, Sharif di Iesolo the Italian Derby of 1972. – Both colts came to glory as stallions in their countries, although hardly anyone can explain why. Their pedigrees never gave occasion to such huge success (both of their sires at most average, Speedy Crown out of a US maternal line just under the first 50, Sharif´s after all one of the best 5 in Europe). 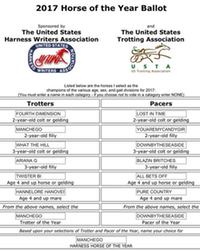 – Both colts have been the most expensive stallions in the old and new world for years, when the sport was at the top of his time in the US and also in Italy. Speedy Crown had a fee of 50.000 Dollars, while Sharif di Iesolo costed more or less the same, despite all currency conversions (if we remember well, in case of the Italian payable by the time of pregnancy, not by living foal…). 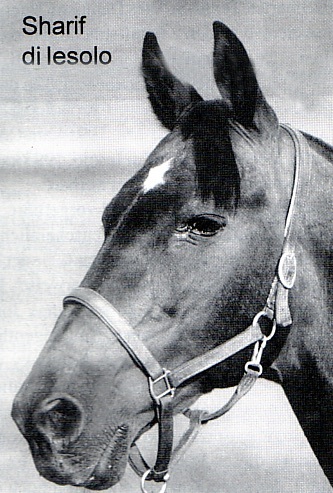 Speedy Crown (1968 – 2000, without any blood of Star´s Pride) as stallion (sired 3 Hambletonian winners, Speedy Somolli, Prakas and Armbro Goal, all 3 out of mares by Star´s Pride), damsire and line founder of the Valley-Victory-line. Sharif di Iesolo (1969 – 1991, also without any blood of Star´s Pride) as stallion (sired 4 Italian Derby winners, Argo Ve, Indro Park, Lancaster OM and Re dei Jet), damsire and renewer of the French breed at all with only 3 stallions, And Arifant, Biesolo and Capriccio (all bred by the visionary French breeder Jean-Pierre Dubois when the French studbook was opened for a short time). Especially the tribe of the former still has a great impact in the French breed with all the sons and grandsons of his best son, Goetmals Wood, like Prodigious, Sam Bourbon, or also Zola Boko in Sweden. – Speedy Crown with a 3x3 line breeding to his father Varenne, still the richest trotter any age with over 6 millions Euros, multiple stallion champion in Italy. 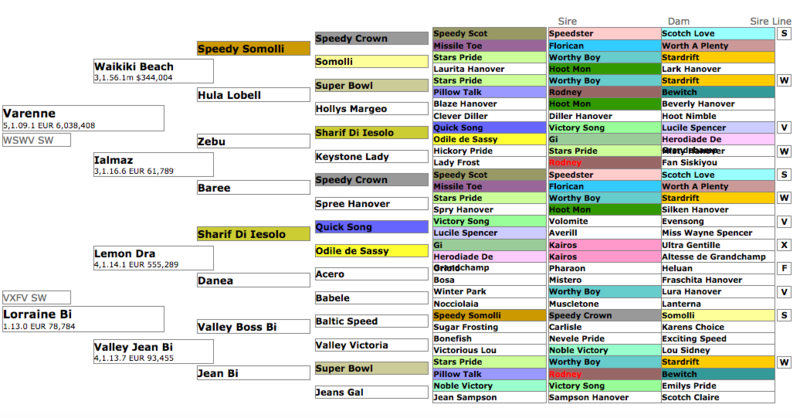 – Sharif di Iesolo with a 4x3 line breeding. 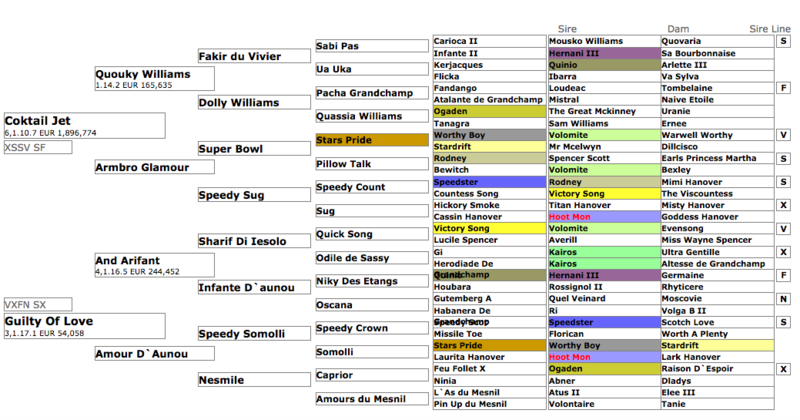 3 leading Italian studs over decades, Orsi Mangelli (not existing anymore/ home of Waikiki Beach, sire of Varenne), Toniatti (home of Sharif di Iesolo and later Supergill) and Biasuzzi (home of Toss Out – and of course our title hero Tister Bi), used Sharif di Iesolo during his whole stud carrer. Together with todays leading studs like Grifone (home of Varenne, which has the Sharif son Zebú as damsire), there are magic results – but never to forget, that the Italians plowed the field for their world class breed in the 70s and 80s with major imports from North America, especially of great racing/broodmares. 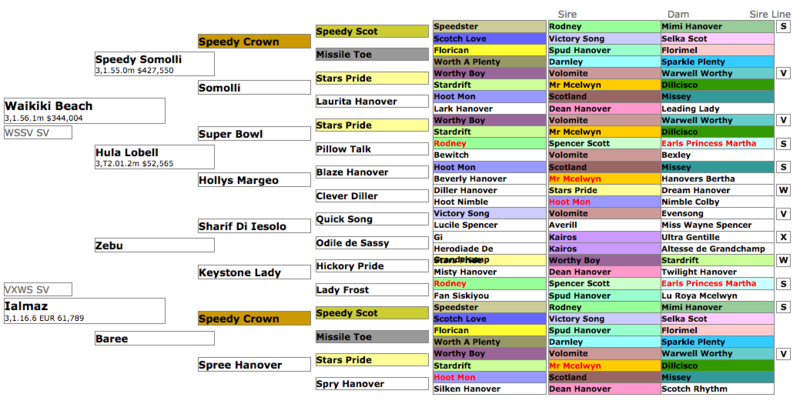 Pedigree of Muscle Hill: We are talking about the best sire in the world. 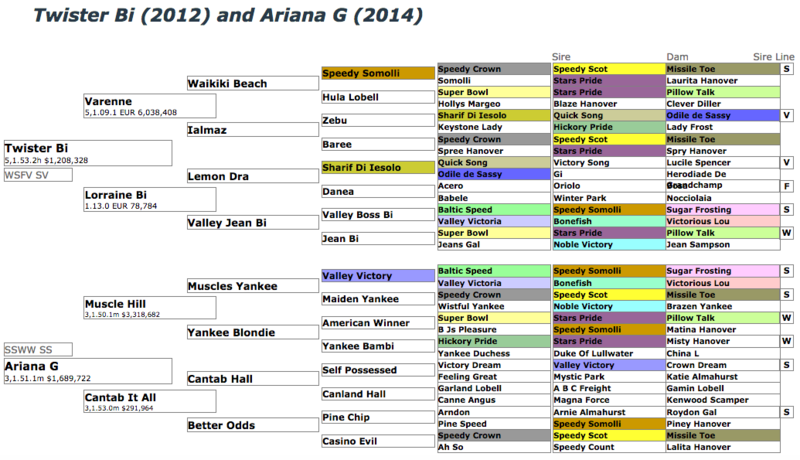 His sire Muscles Yankee is born in 1995, his damsire American Winner in 1990. 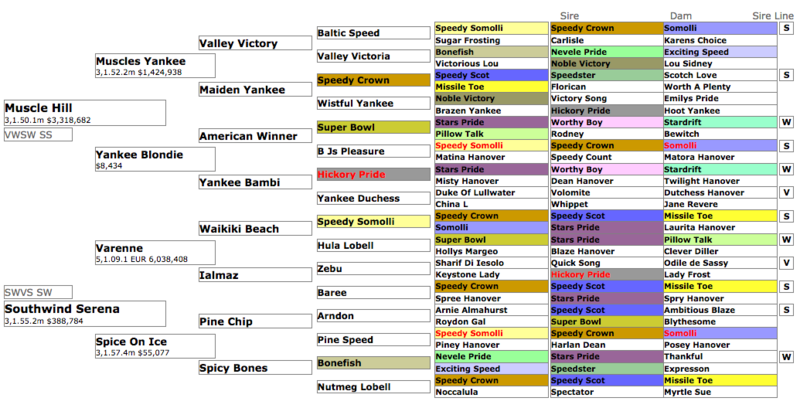 Second damsire is Hickory Pride, born in 1956! – No Valley Victory blood in the pedigree of Twister Bi? Same same, but different, like the Thai people use to say: Instead of Valley Victory one can find his full brother Valley Boss Bi in the pedigree. In summary, it is obviously that the small part of blood of Sharif di Iesolo that came to the US sport until now, made it speed up in a sensational way. If a stallion like Twister Bi could be used in the northern american standardbred world, it will change – we are sure about it. 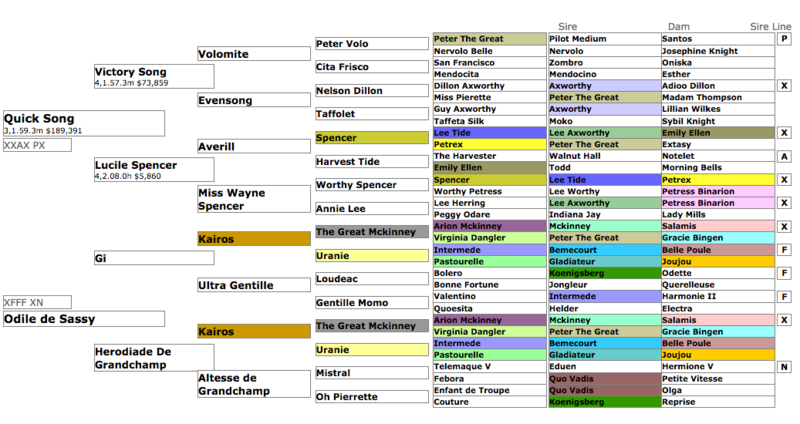 A son of Varenne will be like an outcross to the US blood, that is more and more inbred only to Valley Victory (what, if the Garland Lobell line and the one of Star´s Pride will go down more and more in the next years? ), even he also comes from the Speedy Crown line. Of course, every thoughts in this article are hypothetical. Write us your opinions.